Are you a construction foreman looking for dust control or remediation on construction sites? BigSprinkler.com is your source for the right solutions. We offer top quality solutions at affordable prices. You won't find this quality at this price in a local store. Depending on the size of area and water source capabilities we have the right solution for your project. Our wheeled sprinkler carts provide an easy to move heavy duty sprinkler stand able to withstand your work environment. For increased quality control our sprinkler carts are fabricated in house and then finished with a durable “baked on” powder coat finish. So whether your water source is 10 GPM or 500 GPM, we have the sprinkler cart, fittings and discharge hose to handle the job. Consider our newest designed cart. The 1500H-Heavy Duty Sprinkler Cart is constructed with a 1.5” heavy gauge steel pipe, a solid 1.5" steel axle for weight and with a 1.5” standard thread inlet that can be adapted to fit any hose size needed for the job. 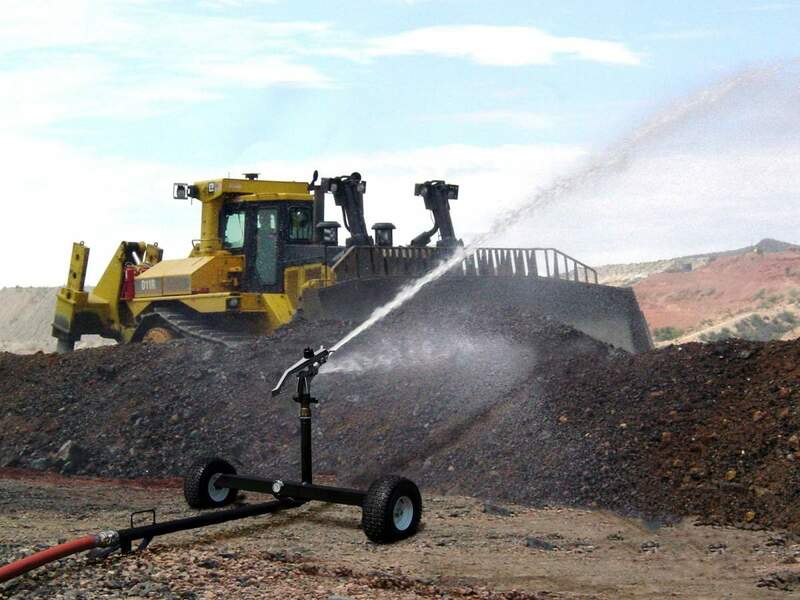 With an impact style sprinkler that handles a higher flow capacity of 30 to 140 gallons per minute and coverage up to 200’ diameter makes this cart a versatile option for any project. For bigger projects you need to look at the big performance capabilities of our 2000S or 3000R sprinkler carts. These two carts take irrigation to another level. Constructed with either 2” or 3” diameter schedule 40 steel tubing for the bodies and 3” square tube for the axles provide these carts the necessary stability to handle pressures and flow rates being supplied with 2”- 4” hose. If a stationary sprinkler stand option is what you need then look at our big 2” Quad Stand. The 2” center post on the quad stand can be adapted to fit sprinklers that have 1.25” to 2” inlets and can be adjusted to a height of 60” for clearance and coverage.